Tri-color beech is a striking deciduous tree that you won't soon forget. It is often used as a specimen tree due to its variegated leaves that may come in many shades of green, pink, and white. They later turn copper in the fall. The leaves are wavy and oval in shape, measuring 4 inches long and 2 inches wide. This tree grows slowly and can reach a mature size of 40 feet tall and 30 feet wide, although it is often much smaller. Tri-color beech has both male and female flowers on the same tree. They usually appear April through May and are not very showy. Its seeds are small tri-cornered nuts, commonly known as beechnuts, which are edible. Most beech trees grow in forests and prefer partial to total shade. Full sunlight may burn their leaves or stunt their growth. This species prefers well-drained, moist, and slightly acidic soil, though it is quite tolerant of a wide range of soils. It does not do well in waterlogged soils. Take extra care if planting in the fall, as tri-color beech is more sensitive to being transplanted at that time. Since beech trees grow slowly, water regularly for the first two years to establish the root system. Keep in mind that tri-color beech is intolerant of salt in soil or water. Propagate the tree through grafting. Beech trees can tolerate cold climates during the winter, but the trees are sensitive to spring frost. It prefers cooler climates with an average high temperature that doesn't exceed 75 degrees Fahrenheit. 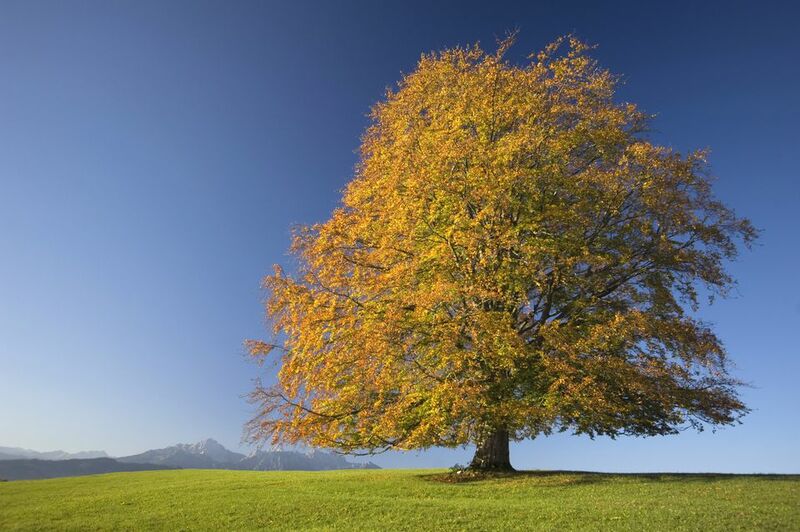 Feed your tri-color beech once a year, before the appearance of new growth in spring, typically around March. Spread a general granular fertilizer (such as Tree-Tone) over the area under the canopy, then water well. Forest animals and human foragers alike are fond of beechnuts, which typically are harvested on the ground shortly after they fall from the tree. The triangular nuts turn a shiny brown color when ripe. Harvesting is typically done in October in many regions of the U.S.
Due to competition (with wildlife) for the small but flavorful nuts, it's best to harvest early in the morning, preferably after a spell of wind has helped drop the nuts. Be careful: Beechnuts are mildly toxic, so do not eat too many of them at once. The European beechnuts are bitter, unlike the sweet American beechnuts. Tri-color beech can be planted close and pruned to become a hedge, as it tolerates pruning well. However, do not prune until it has become established, which can take one to two years. This tree is very slow-growing, so keep that in mind when designing your garden. It is perfect for use as a specimen tree, or a shade tree if given enough time to grow. Grass and other plants will not grow well under the tri-color beech, due to its fibrous root system. The leaves are prone to scorching if they are not sheltered from the hot sun or dry winds. Some caterpillars feed on beech leaves. Aphids will cause sticky, dripping honeydew. Diseases include canker, powdery mildew, and beech blight. Beech scale can be a problem occasionally. Tri-color beech trees are among the most popular in public parks and gardens across North America and Europe. They grow slightly faster than other large ornamental trees, which adds to their appeal for landscapers of large public spaces. One of the oldest and largest public parks featuring tri-color beech trees is in Brookline, Massachusetts, near Boston. The beech trees at the Longwood Mall were planted prior to the Civil War, making them the oldest stand of this type of beech tree in the country. There are numerous cultivars of this beech variety. Some of the oldest and most popular include the copper or purple beech (Fagus sylvatica purpurea), which as its name suggests, has purple leaves that turn a dark shade of green in late spring and early summer. Another popular cultivar is the dwarf beech tree (Fagus sylvatica Tortuosa), which many people will recognize by its twisting trunk and gnarled branches. The weeping beech (Fagus sylvatica Pendula), which looks similar to the weeping willow, and the golden beech (Fagus sylvatica Zlatia) whose leaves turn gold in late spring, are other popular versions of this tree.